Despite what Radiohead has to say on the matter, Spotify is a great venue (if not the venue) for discovering new music. Users can seamlessly switch between Haydn and Hova and back again without skipping a beat. Beyond mere music, however, the platform boasts a vast reservoir of comedic content. Spotify is home to the decades-deep libraries of Bill Cosby and Monty Python as well as modern-day releases from the likes of Louis CK and David Cross. It’s a wonderful, if underutilized, source for comedy fans. That’s why it’s both welcome and curious that Spotify has only now introduced its first dedicated comedy app, the aptly titled Official Comedy. The Official Comedy app has an unfortunate name. Spotify opened its API all manner of third-party apps development in the fall of 2011. You can access them on the left side of the desktop app via the “App Finder" button. Nearly all of the available options are—as you might suspect—music-oriented apps, such as the lyrics in synced time offered by TuneWiki or the expert-curated lists from Rolling Stone or Pitchfork. The Official Comedy app is the first to tap into Spotify’s vast comedy library to those looking to discover new talent. It’s a rough start, but may find its utility moving forward. Official Comedy has four main channels listed across the top of the screen, which all—like the app itself—have defiantly matter-of-fact names. The first channel, Funny Now, is basically the home page offering links to popular playlists and comedians of note. 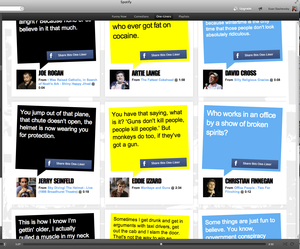 The next tab, Comedians, is a curated list of professional funny folks that include links to in-app pages, complete with a brief bio and list of their work available on the service. For now, there are only 35 comedians featured in the "biased, but absolutely correct list" that runs the alphabetcial gamut from Aziz Ansari to Daniel Tosh. Make your friends think you are the font of all comedic wisdom. 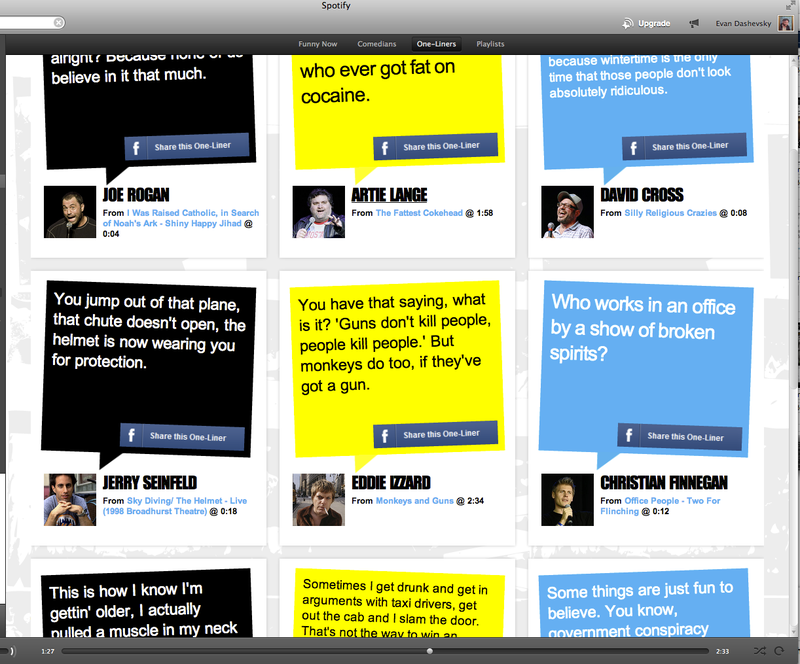 The next tab, One-Liners, is a list of highlighted quips along with a link to the track they came from. For example, the app pointed out this line from comedian Brian Regan: “If you only need glasses when you drive why not drive with a prescription windshield?” (#Boom). In this case, the app tells you this particular witticism hails from the track “Horns & Windshields” and can be found specifically the 1:51 mark. The app even allows you to share that line to your Facebook page along with a link. Under the final tab, Playlists, users can find curated playlists based on particular topics. For example, if you’re in the mood to listen to a few hours of race-based comedy, you can click through to the “A Post-Racial Comedy World” playlist, which culls together 33 racial-centric tracks from the likes of Chris Rock, Eddie Murphy, Margaret Cho, and others. Similarly there are 32 tracks about history in “Comedy is Tragedy Plus Time,” or 66 tracks about language in “Why Americans Peak Like They Do”. From a functional point of view, the app is still somewhat buggy, in that it won’t always auto-populate with new content as you scroll down. However, Official Comedy may yet prove a wonderful way to discover new joke-slingers for those times when you need to do chores around the house and you just can’t give Yeezus another listen.